This is the second part of our Top 10 wines of 2014. Part one can be found here. The top 5 was dominated by rosé and white wine. Wines 6 to 10 features a wonderful Champagne and some great value reds. This champagne was new to DiscoverVin in 2014. Its a great value Champagne from a small producer. It received 2 stars in French "wine bible" Guide Hachette 2014, beating a lot of well-known champagne brands, so it doesn't get any better at this price. Oz wine writer Sean Mitchell reviewed it recently: " Overall, this is a very impressive Champagne and one that I'll be buying. " It has quickly become one of our best sellers. More details on this link. 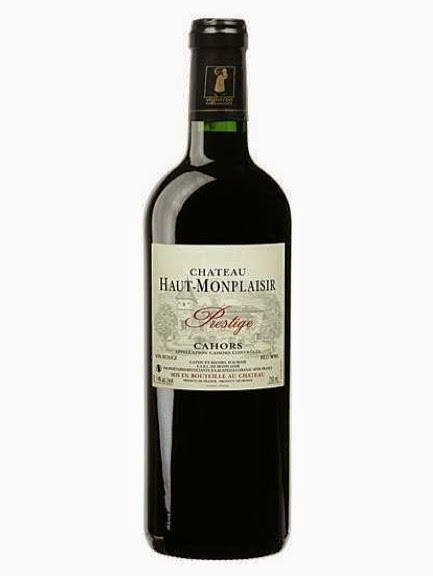 The 2010 version of this wine was selected in Gourmet Traveller magazine's Bordeaux feature in August 2014 and made it into the top 10 - and quickly sold out. This 2011 we think is just as good! An easy drinking merlot blend from the Bordeaux Cotes de Bourg appellation. The vineyards of Bourg face Margaux across the Gironde estuary and offer exceptional quality and excellent value for money. This is a good example of what we specialise in- finding good value Bordeaux wines from small producers. The guys from The Wine Wankers loved this one. Read about it here. A great Malbec from the Cahors region from a top organic producer. This wine was mentioned in a review of Cahors, where the malbec grape originates from, in Decanter October 2014 as an up and coming producer. Château Haut-Monplaisir is owned by Cathy and Daniel Fournié. Cathy took over from her parents in the 1990s and adopted modern practices. These approaches have lead to impressive improvements in the wines from the property. They are now certified organic producers. "Cahors is that rarest of all wines: both a rising star and a timeless classic." --The Guardian (UK) April 2013. This producer is a rising star of Cahors and this vintage is one of their classics. Details here. This wine is from the Gaillac region near Toulouse in south-west France. Wines have been made here from Roman times. Nowadays both "new" varieties like Shiraz and merlot are used as well as ancient indigenous varieties that grow wild and were domesticated many centuries ago. This one is a blend of shiraz, merlot and an indigenous variety Braucol. "This is easily the best Gaillac wine that I have tried" Sean Mitchell, Grape Observer, June 2014. Another good example of the wines that DiscoverVin is bringing to Australia. From an ancient vineyard that has been producing quality grapes for many centuries, premium grapes are now being made into modern, organic and clean wines while retaining characteristics typical of the terroir. Again this offers great value for money for the quality! This wine was awarded a Silver medal at the Concours National des Vignerons Independants 2010. A rare budget-friendly Saint-Émilion red wine which you will love for its soft rich fruit, balance and complexity. Bronze Medal Concours des Grands Vins de France (Macon). Another example of the great value wines we are bringing from France. To recap, out Top 10 for 2014 included 2 rosé, a dry white, 5 great value reds from a mixture of appellations, a new Champagne to Australia and a stunning dessert wine from the Pyrenees. If you haven't tried any of our wines, we suggest that any of these top 10 would be a great place to start! Please see our website for terms and conditions.